There’s an excellent opportunity with the limited time Kimpton Flash Sale. You’ll earn a Kimpton Free night when you stay 2 or more nights at any Kimpton property between now and September 16, 2018. The free night is good through March 2019. This sale is only available through May 9, 2018, so you have to book now if you want to participate. Anna loves the Kimpton robes. Where can you redeem Kimpton Flash Sale free nights? There haven’t been too many offers from Kimpton lately as they’ve been focusing on the integration with IHG that occurred in January 2018. With this Kimpton Flash Sale, it seems that Kimpton is now getting back on track with some truly great promotions that are worth a look. The Kimpton Flash Sale offers you the ability to earn up to 15 free nights through this promotion. All you need to do is book your reservations by March 9, 2018, and stay by September 16, 2018. Your free nights will post to your account 2-4 weeks after you check out and are good through March 31, 2019. The Kimpton Summer Password is a unique treat by Kimpton that isn’t offered by other brands. It’s a fun way to get some additional goodies and every Kimpton property participates in their own unique way. The Kimpton Summer Password for 2018 hasn’t been released yet, but if you time your reservations well, you will be able to participate by saying the password when you check in. In the past, I’ve received free valet parking, food & beverage credits, extra drinks at the bar, and grab bags filled with surprises. Usually, you can make Kimpton promotion reservations and cancel them later if your plans change. However, this Kimpton Flash Sale requires you to make non-refundable reservations, so please only book a room if you know that you’ll be able to make it. As great as it would be to earn some free nights, you certainly don’t want to waste money if your plans may change. 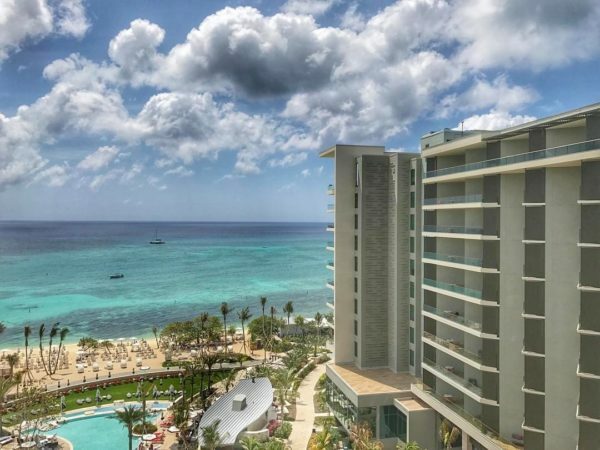 Breathtaking view from our room at the Seafire Resort in Grand Cayman. Welcome to the terms and conditions, a.k.a. “small print,” where we are obliged to let you know this member exclusive offer is subject to availability and valid for stays from May 8, 2018, through September 16, 2018. Offer must be booked by May 9, 2018, or while supplies last under this exclusive rate code. Book by date is subject to change. The Free Night Certificate is valid at participating hotels in the IHG® Rewards Club Family of Brands and must be redeemed, and stay must be completed by March 31, 2019. This Free Night Certificate will be deposited into your account 2-4 weeks after you’ve checked out from your paid stay for this offer. Redemption is subject to availability and contains blackout dates that vary by hotel. This night is non-transferrable and cannot be redeemed for cash or anything else. The room must be booked by the member. You may only earn 15 total Free Night Certificates for the duration of this offer. The Free Night Certificate is valid for one standard room night rate only. Members are responsible for all incidental charges and applicable taxes. The IHG® Rewards Club Spire Elite complimentary room upgrade is applicable if available upon arrival. All reservations that will utilize the Free Night Certificate can be booked online at ihgrewardsclub.com or by calling the IHG® Rewards Club Service center at 1-877-318-5890. Individual hotel’s cancellation policy applies to the use of the Free Night Certificate. Cancellation fees apply if cancellation is made outside of the hotel’s cancellation time period. The Free Night Certificate rules and regulations are subject to change. The world being the way it is, additional taxes and fees may apply. Not valid in conjunction with any other promotions or offers. Not valid for discounted or negotiated rates, groups or existing reservations. Certain restrictions and blackout dates may apply. Finally, Kimpton Hotels reserves the right to cancel reservations booked with erroneous room rates. The Kimpton Flash Sale free nights are good through March 31, 2019. That gives you plenty of time to use your free nights at any of the participating IHG hotels. That’s right, this free night certificate is good at ANY of the participating IHG hotels, not just Kimpton properties. As much as I love Kimpton, their properties aren’t always where I’ll be traveling. Although blackout dates may apply, I’m confident you’ll be able to get into your choice of IHG hotels using one of these certificates if you’re flexible on dates. Who’s ready for a game of 8-ball at the Kimpton Journeyman in Milwaukee? I’m going to participate in this Kimpton Flash Sale promotion to earn some IHG points and nights towards retaining my Kimpton Inner Circle and IHG Spire status. The bonus of the free nights that are good through March 2019 will allow us to book some awesome stays during upcoming vacations.